Videos can reproduce chunks of a time and era gone by, letting us re-live our life experiences over and over. For example, a birthday or an anniversary celebration with the right kind of additions of effects and sound can become a piece of your personal family history that can be passed down the generations. Be it personal moments, corporate presentations or educational teaching aid and projects, we need to edit all these moving images, pictures and animations, with sound and special effects, making video editing a critical aspect. There are many highly complex and technologically advanced software available for professional film and video editors. We, however, are focusing on listing the best video editor online for those who do not need all the bells and whistles of advanced software. When you have a 4K resolution to play around with, it’s easy to capture, create, view and play around with your videos with WeVideo. The interface of this online video editor is simple to use and helps create good videos. It can be used to edit on any device, offering you the flexibility of shooting on any device while editing the shot video on a completely different device. It is available on all popular platforms including Windows, Mac, Chromebook, iOS, Android. You can be as creative as you want when you can control everything like texts, transitions, and motion effects. It has three versions; Free, Power($4.99) and Unlimited($7.99). Each successive version has some extra and powerful features than its earlier one. For example, in the free version, the Max video resolution is 480p, for Power version, it is 720p HD, and for the Unlimited version, it is 4K ultra HD. You could try out the free one before paying up. Video Toolbox works really well if you have a large file to edit. It’s free and can process files up to 600 MB. You can convert into any popular format including AMV, ASF, MP4, 3GP, AVI, FLV, MKV, MOV, MPEG, VOB and much more. You can also add watermark to your videos, merge multiple files to make a single track, extract audio and video or subtitle text. One highlighted feature about this online video editor is that it allows you to work on online video from popular sites like YouTube without downloading it. Although it does not promise to be a complete package of editing features, it will certainly work well if you are just starting off with your first video edits. You can work on online videos from some popular websites without downloading them. Loopster is one of the best free online video editors where you can reorder, speed up and slow down your video clips. You can add text, graphics, sound effects, and some really fancy transitions. You don’t need to be a professional editor to use this tool as it caters to giving you an easy platform where you can make your regular video look like it’s professionally edited! One of the advantages is that it includes a good collection of varied sounds effects that can have an added impact on your videos. Moreover, it also gives you the freedom to work on your videos from anywhere; at home with your laptop or outside with your smartphone as Loopster has its iOS and Android version. Has its iOS and Android versions making the tool flexible. Magisto lets you accelerate your video marketing with Video Storytelling as fast as posting a blog on websites. The tool is effective as it can make your business video very powerful. In this era where everything can be sold through digital marketing, Magisto offers you analytics for business videos too. So if your focus is on building your business or advertising your services, then Magisto is worth a try as an online video editor. The interface is simple to get familiar with. So go ahead and use Magisto to drive home all the internet traffic you can. A good tool for professionals. A useful tool that helps in widening your marketing reach. Kizoa is widely known for the options it provides to put beautiful special effects in your video. It guides you most efficiently to build a professional and elegant video. The tool works on fine details like the size, duration, timing, position, etc. of the video. It offers you a choice of adding multiple animations to make your video project attractive and exciting. You can easily cut videos into a number of clips you want. 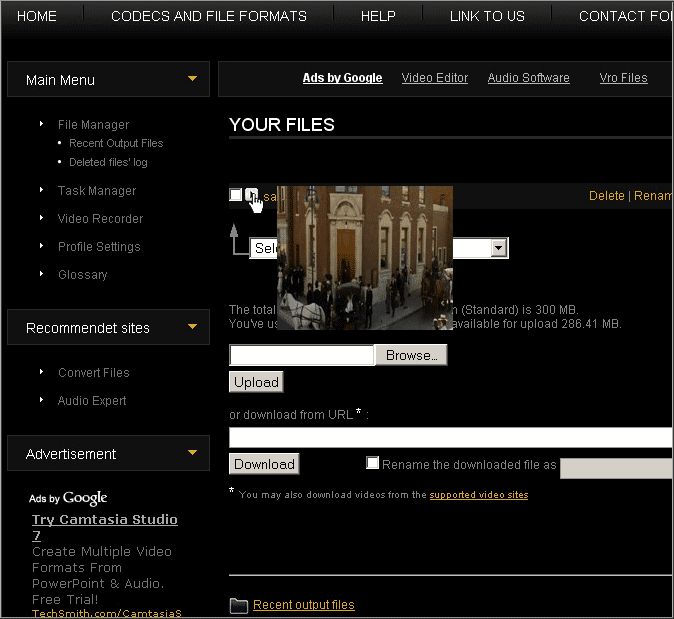 It offers a large number of video intros and outros that can be embedded in your video by simply dragging and dropping. You can add as many songs as you need. You also have the option of increasing and decreasing volume of a particular audio that automatically adjusts to the other audio aspects. Definitely a favorite on our list of online video editing sites. Multiple transition options for beautiful effects. 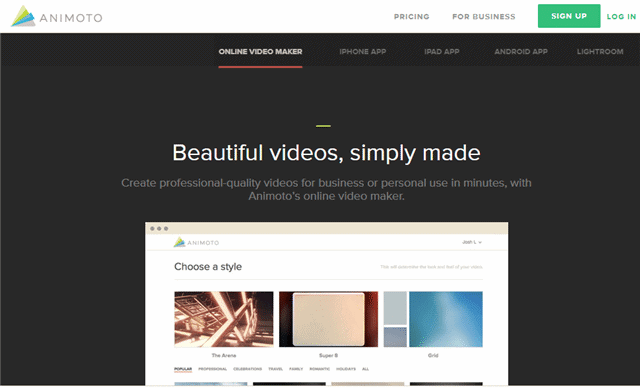 Animoto is one of the best Online video editors to create a professional video for business and personal purposes. Whether it is Facebook, Instagram or Picasa, Animoto lets you grab photos from any platform. The tool is so flexible that it can suit any occasion be it classic, funky or somewhere between. Just imagine adding in a DJ, or a bunch of songs or even your favorite tracks to create vibrant personal videos. Animoto also offers using captions and title cards so that you can narrate your stories in your own style! You can customize the pace for images and highlight the ones you like the most. Animoto assures that their music library and all the videos are licensed for hosting and distribution. Cool isn’t it? The output video quality is really good. It has multiple advanced features as compared to similar tools. If you want to create a promotional video for a new product of your company and wondering if you need some professional to do it, then do have a look at this online video editor called Wideo. Armed with simple options like drag and drop, Wideo has all that it needs to make a marketing video for your business enterprise. It has the added benefit of allowing you to make your own animated videos. You can begin with basic artwork with the marketing video templates in Wideo. The tool is quite effective for making marketing, promotional and tutorial videos in just a few minutes. PowToon is an all-in-one online video editor tool that covers personal, professional and educational sectors. You can make informative and conventional video presentations using PowToon. It is sure to impress your colleagues and bosses. Teacher and lecturers too, use this as a teaching aid as students get bored easily with monologues. If it’s your best friend’s birthday or engagement, design wonderful video embedding lots of memories into it and making it an unforgettable event for all. 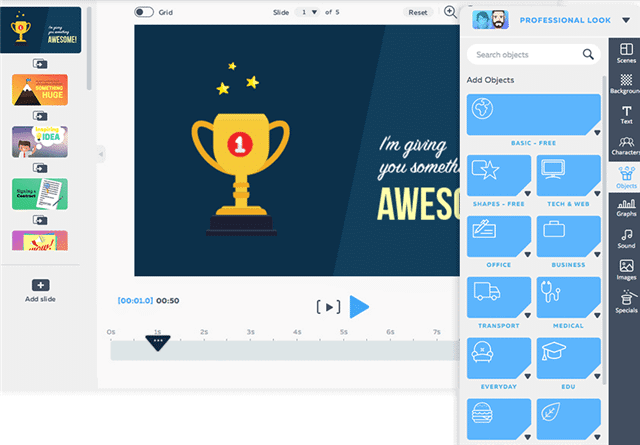 PowToon has ready-made templates to make high-quality presentations in just a few minutes with simple drag and drop options and features. Flexible to use either professionally or personally. Allows making videos in no time with ready-made templates. ClipChamp online video editor that allows you to compress faster! 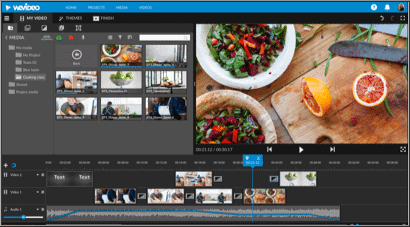 If you are looking for a perfect online video editor for beginners as it has an intuitive and simple platform where you can trim, rotate, crop and flip videos the way you want – ClipChamp is worth looking at. It has an innovative video compression approach and inbuilt privacy. This allows you to transform your videos into a beautiful piece of art. After the editing is done, you can select the option to save on your device or even share it with friends. This online video editing app compresses your videos in the format you want so that you can upload it faster and make distribution easy. You can also share the output directly on social media networks like Facebook and YouTube. A simple and clean interface especially for beginners. Using Video Cutter in three simple steps! Online Video Cutter is quite a popular tool for giving a robust and rigorous platform to the users to multitask on their videos. Online Video cutter is one of the very few free online video editors. The tool is handy when it comes to cut a video part or to crop a video from a start to an end point. It supports all the formats, and unless the file is too big or damaged, it will give you great results. It has security assurances as it deletes all the videos from their servers within a few hours after you are done editing them. Definitely high on the popularity list as it is absolutely free! Of course, there are many more options available; but we have picked out the best of the online video editors available today. If you think we missed out on any good options, we welcome your suggestions. You can email them to us on the email ID shown below. Previous articleWhat is the Difference Between a WPN and VPN?